Mexican Wild Sunflower Honey's creamy texture and elderflower tang blends in with spices and pears. Place the spices for the pears in a small saucepan with 200ml water, the lemon juice and sugar. Bring to the boil, cover and simmer over a low heat for 5 minutes. Peel, quarter and core the pears and add to the liquid. Bring back to the boil, cover and simmer for 10 minutes or until the pears are tender. Transfer the contents of the pan to a bowl and leave to cool. To make the glaze, place the honey, vinegar, sherry, stock and ginger in a small saucepan. Simmer until reduced by half, then leave to cool. Preheat the oven to 220°C, gas mark 7. Pierce the duck skin all over with a fork. Brush with oil and season. Place the duck breast-side down in a roasting dish. Roast for 15 minutes, reduce heat to 190°C, gas mark 5, and roast for a further 25 minutes. Drain off the fat, reserving 2 tbsp, and turn the duck over. Spoon the glaze over the top, discarding the ginger slices, and roast for a further 25 minutes, or until thoroughly cooked, basting halfway through. Pour any juices inside the duck into the roasting pan. Transfer the duck to a plate to rest for 15 minutes. Trim the pak choi, slicing thick stalks about 1cm wide lengthways. Wash and shake dry. Heat the reserved duck fat in a large saucepan, add the pak choi, season and sweat for a few minutes. Skim the excess fat off the juices in the roasting tin, add the juices to the saucepan, cover and cook for 2 minutes or until the greens are tender. Carve the duck. 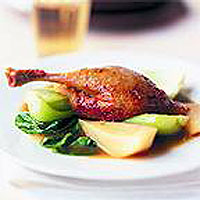 Serve with pak choi, juices, and pear quarters. This recipe was first published in January 2001.